Interesting line of research. It seems to validate the layout of the subway system, at least; no matter which is cause and which effect, the correlation is clearly there to see, as far as the downtown/midtown cores being the center(s) of the action. The data might even be interpreted to say that there is an incipient trend to fill in the gap between the two centers. I think it would be nice to have an additional, higher tier of income, like one of $100k and above or to adjust the boundaries of the 3 you have now. At one point you call the over $40k people “middle class”, but you in other places refer to that as the “high income” group. A person making $40k in NYC might well be happy enough with their lot, but I imagine that they would identify more with the working class than the jet set, more hoi polloi than hoity-toity. You warn us about the potential distortion in Brooklyn regarding the City employees working in Brooklyn all being officially located in downtown Brooklyn; does that suggest a similar possibility in lower Manhattan (perhaps also in the Bronx or Queens too)? I wish you would get off the bandwagon of trying to fold the NYC commuter RR’s into the subway system. As I posted in your recent When are Express Trains Warranted, Part 1 … , there are a lot of problems with that idea, not the least of which are lack of capacity for both passengers (need more trains) and trains (tunnels and terminals at or near limits), and the extremely huge hits to revenue by cutting fares; not to mention the hits to political clout when you alienate the suburban riders who then desert the commuter rails and agitate for better roads. I suppose you could instead raise subway fares to commuter train levels instead; that might not alienate suburban riders as much and it could help reverse the decline in bus ridership – after all, what’s a little political chaos among friends, anyway? 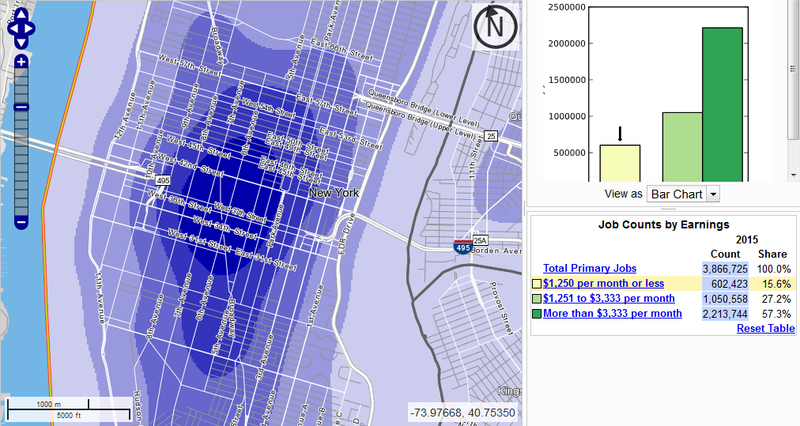 The income numbers given are per worker, not per household, so $40,000 is lower middle class even in New York. 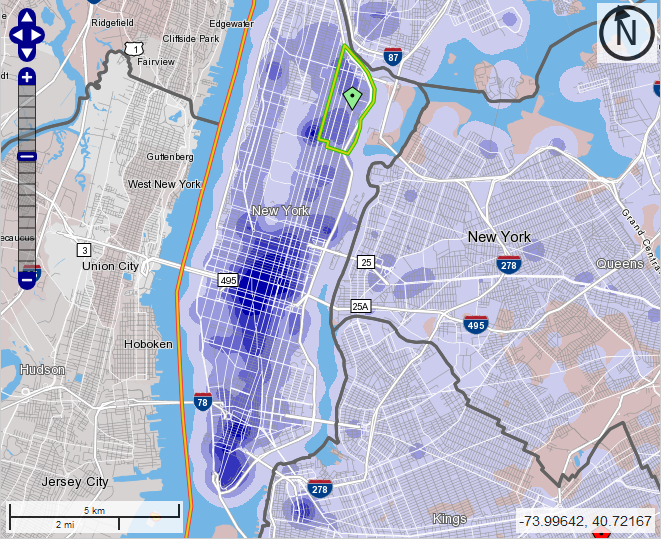 As for commuter rail: the Hub Bound Report gives capacity numbers per entryway into the Manhattan core. Check table 20 on PDF-p. 53: the LIRR and Amtrak, with four tracks that aren’t at track capacity (there are only about 37 peak LIRR tph and maybe 2 Amtrak tph coming from the east), carry 34,000 passengers into Manhattan. 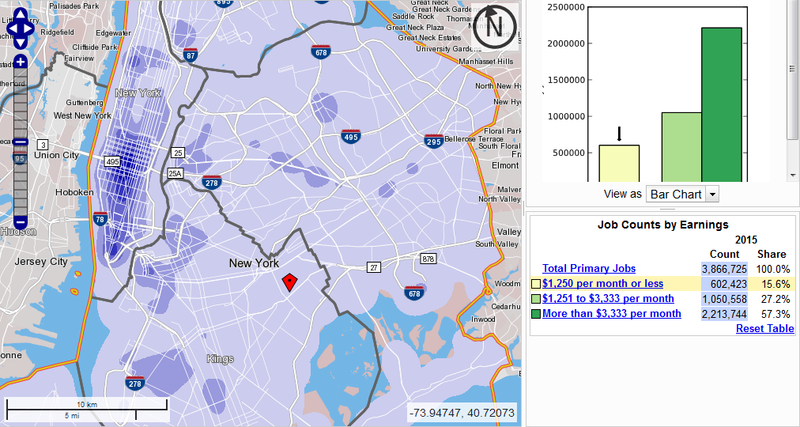 In contrast, from the west, New Jersey Transit and Amtrak carry 30,000, almost as many, on two tracks. The busiest subway lines carry 29,000 (lettered lines, N/Q/R) or 28,000 (numbered lines, 2/3 and 4/5) per track pair, with much shorter trains – the IRT trains are equivalent to 6 mainline cars, and the LIRR runs 10-12 cars per train, which are also 20% wider than IRT cars. Even the New Jersey Transit capacity problems are overstated, but the LIRR carries about one third as many people per unit of train floor area as the busiest subway trains at the peak; the Hub Bound report mistakenly reports the LIRR car size as if it’s the same as the BMT and IND’s, and if you use correct numbers, there is about 1 passenger per square meter of train area, compared with 3 on the IRT expresses. So there’s capacity on the LIRR trains for urban riders, as well as capacity on the tracks for additional trains. The hit to revenue coming from fare integration isn’t what you think it is, because people in Queens would be riding off-peak and not just at the peak, where they are the most expensive to serve. Greatly over estimated. Take the subway a stop or two or three, change to the LIRR and then change to the subway again in Manhattan. For a longer total trip. Yeah, un-huh, sure. It seems the biggest problem here is that rich people don’t want to be crowded together with poor people in the same train. In Tokyo some commuter trains with reserved seats are appearing to cater to those types, together with advertisement promoting commuting at an earlier or later hour than the peak. Of course this is an answer to johndmuller not to the article. 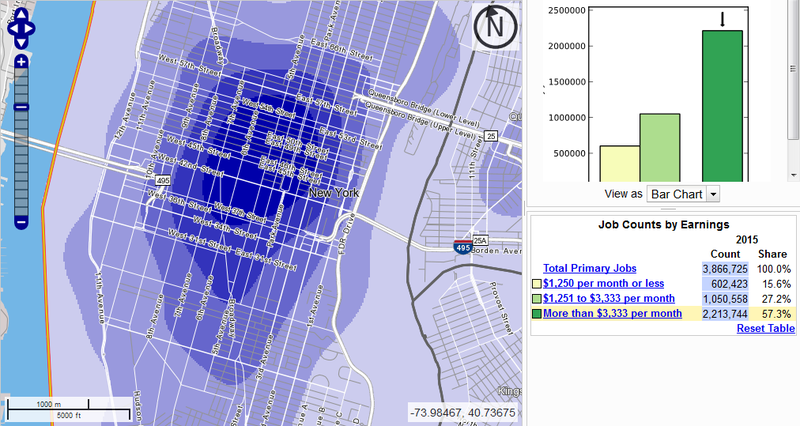 Alon, I wonder what the results would look like in a metro with more job sprawl than New York City. For example, one of the big failings among many of the transit system in Metro Detroit is that it provides bad service from the city of Detroit to the suburbs. A lot of (poor) urban residents work in the suburbs, many of which have decided to opt out of public transit entirely. The US has plenty of metro areas with dispersed employment. This suggests a natural weakness of the methodology used in the original post. The dense concentrations of low-income workers might be in the same places as the dense concentrations of middle and high-income workers. But if low-income workers are largely working in strip malls and the like, then it may be that most of them are spread out across vast low-density spaces, while high income workers are concentrated in these centers. 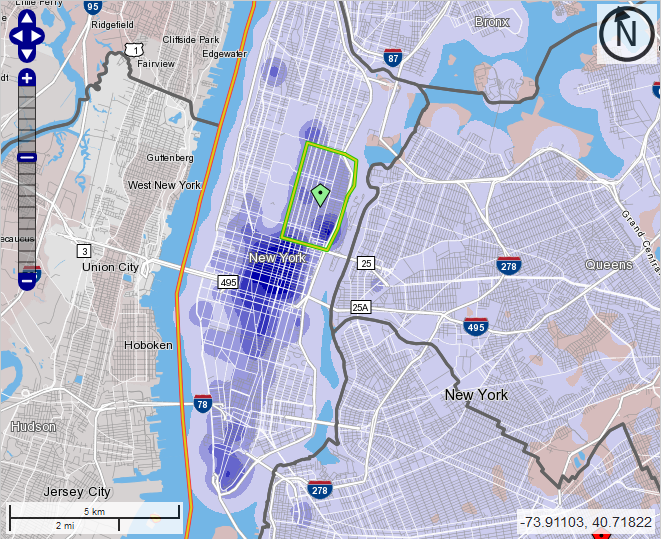 Of course, for purposes of transit planning, it may well be that the dense concentrations are all that matter, and there’s just nothing to be done about the vast low density sprawls. In Wayne County you do see more serious differences, sure. In the lowest-income category the highest employment density is still in the Detroit CBD and around the Woodward Avenue corridor, but then there are a bunch of job clusters in Dearborn around the malls, which are much smaller for the middle class. But the malls are still big destinations for the middle class, as consumers. There’s a transportation need to these malls regardless of income level – the difference is that cars satisfy it just fine, so everyone who can afford a car drives. There should be blobs at the auto plants. There still are auto plants in Michigan. For instance Wikipedia says River Rouge in Dearborn still has 6,000 employees.